We’ve reviewed quite a lot of burgers from Bread Meats Bread over the last few months, but that’s simply because they keep coming up with new menu additions and new specials that draw us back to St. Vincent Street over and over again. 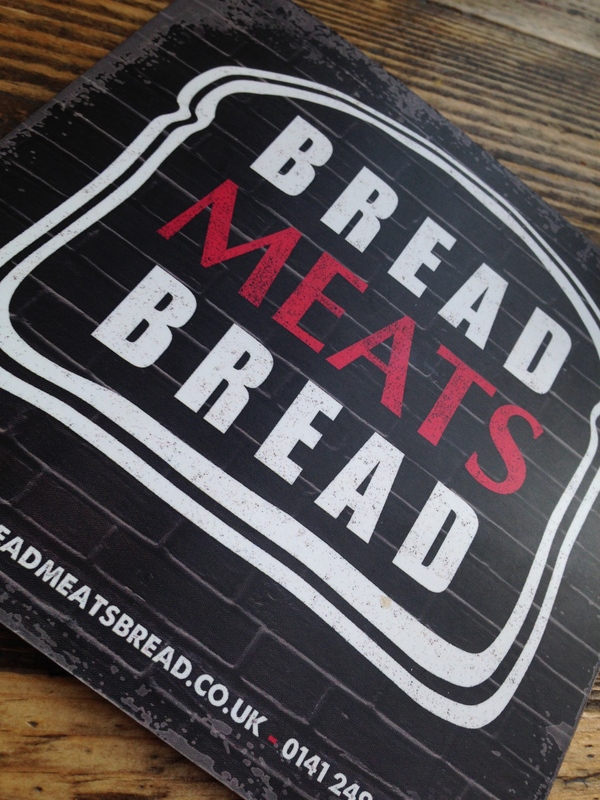 Bread Meats Bread have been producing some of the best burgers in Glasgow for some time now, but there’s always been a notable absence of veggie or vegan options on the menu, other than a grilled cheese or veggie melt sandwich. A couple of vegetarian friends of ours have been unable to really enjoy Bread Meats Bread due to the lack of options available to them. Thankfully, that’s all changed now. Bread Meats Bread’s new falafel burger is; without a doubt, the best veggie burger I’ve ever had. And it can easily be made vegan too. 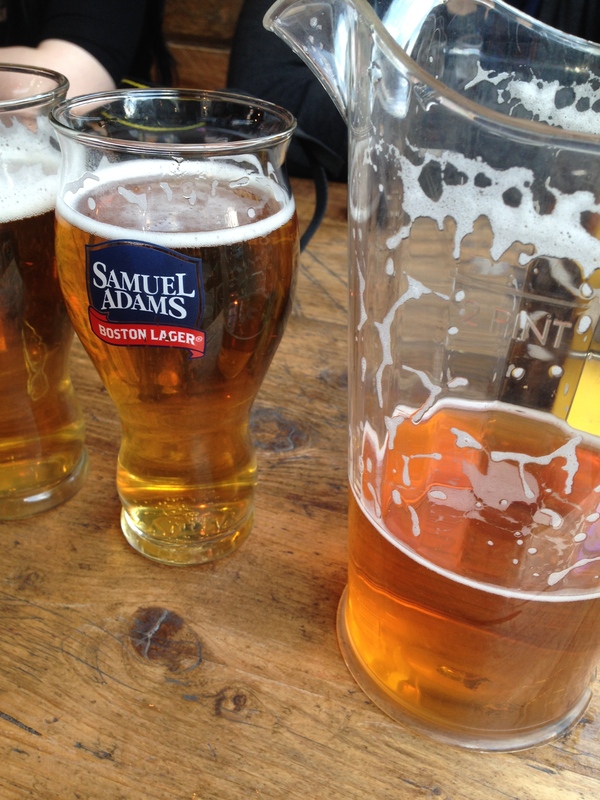 Pitchers of beer for £7. Always a bonus. 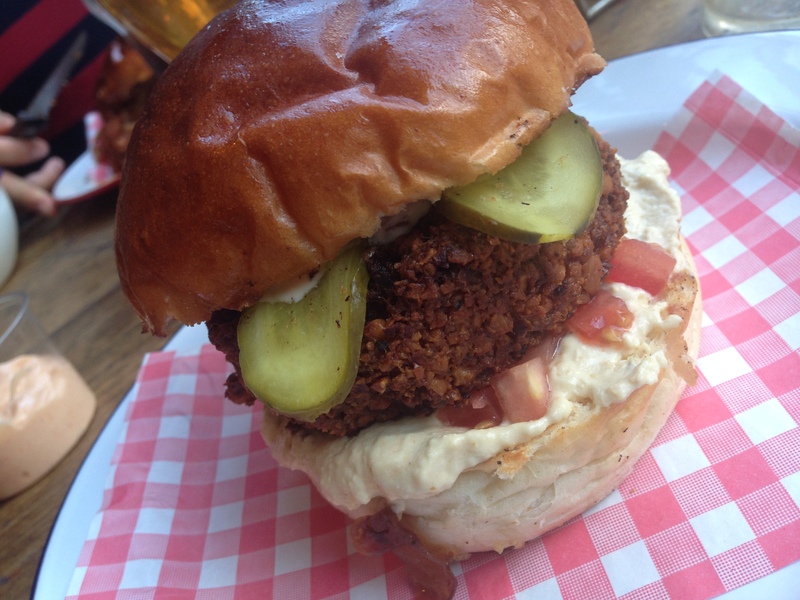 Consisting of a falafel patty that’s made in-house, the burger is topped with homemade hummus, pickles, tomato and spicy mayo. You can choose from a brioche bun or a vegan-friendly gluten free potato bun. If you’re vegan, you can also substitute the spicy mayo for another option or just not have it at all. It’s up to you. 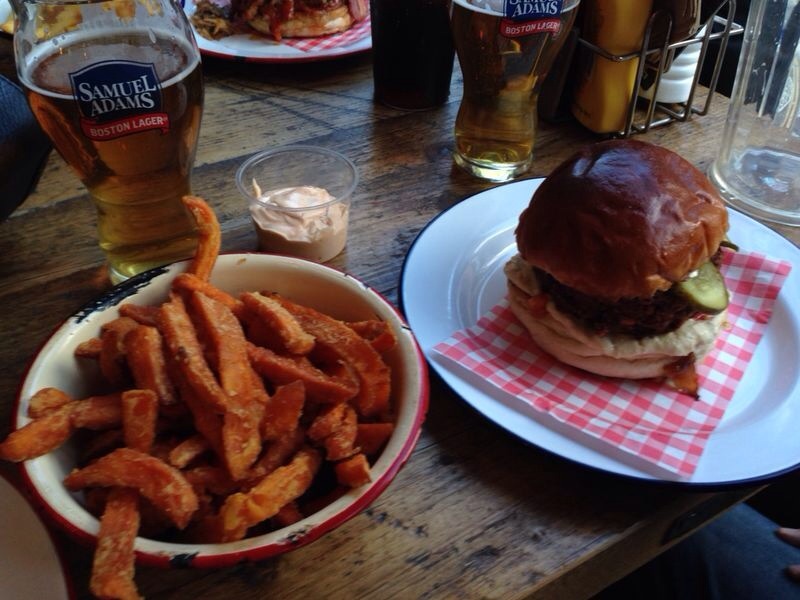 We went for the brioche bun option with spicy mayo. 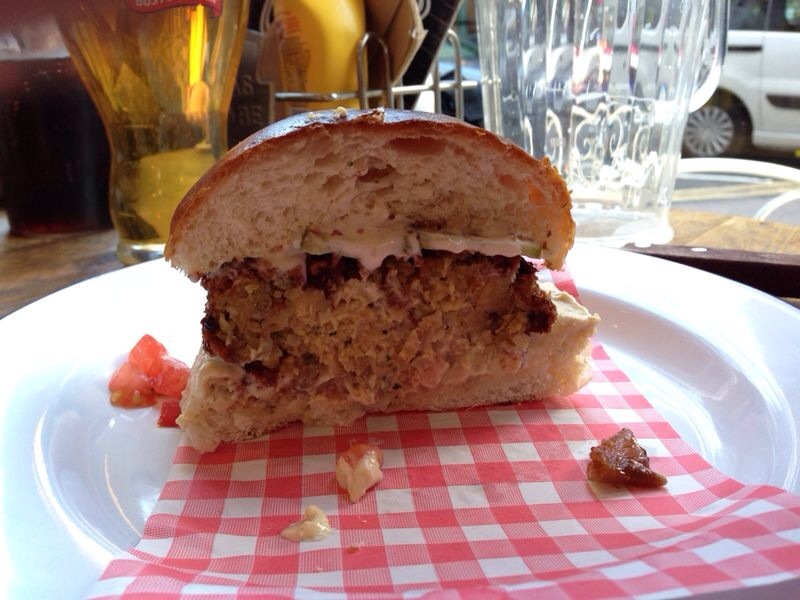 The first thing that hits you when eating this burger is the awesome crispy crumb coating that surrounds the falafel. It’s herby, light and helps keep everything in perfect burger form. 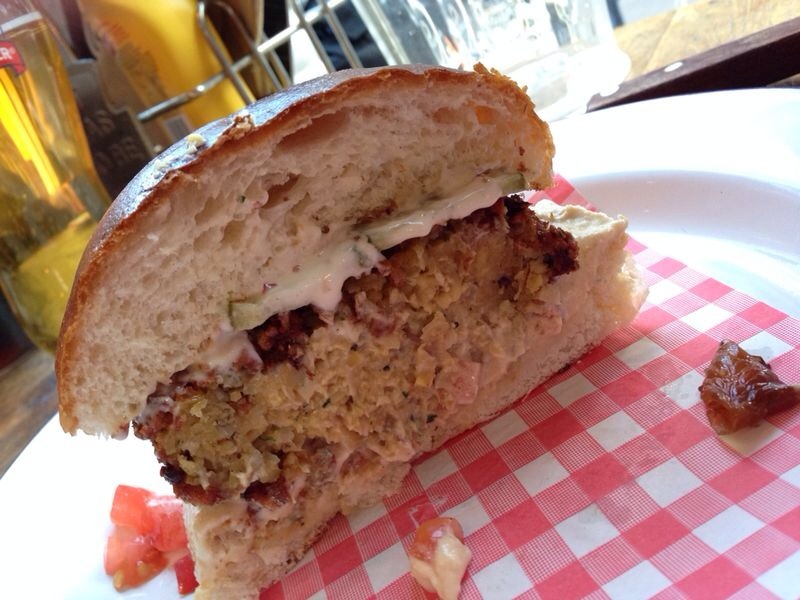 If you’re worried about falafel falling apart and out of the bun, don’t be. In fact, I was able to cut this in half with no issues and it remained mess-free throughout. The falafel wasn’t dry and was beautifully seasoned. It had a nice kick to it, but wasn’t overly-spicy. The spicy mayo also had a strong kick to it but was mellowed slightly by the hummus, which was delicious. The pickles and tomato helped provide a fresh little burst of flavour at the end of each bite and finished off the burger nicely. No one flavour overpowered any others. The amount of falafel, mayo and other toppings was just right. Everything was spot on. Topped with spicy mayo, pickles, tomato, hummus on a brioche. The burger can easily be made vegan. We had ours with sweet potato fries. Ours was served with sweet potato fries, but there are many other options available. If you’ve read any of our Bread Meats Bread reviews before, you’ll already know how good we think the sweet potato fries are. 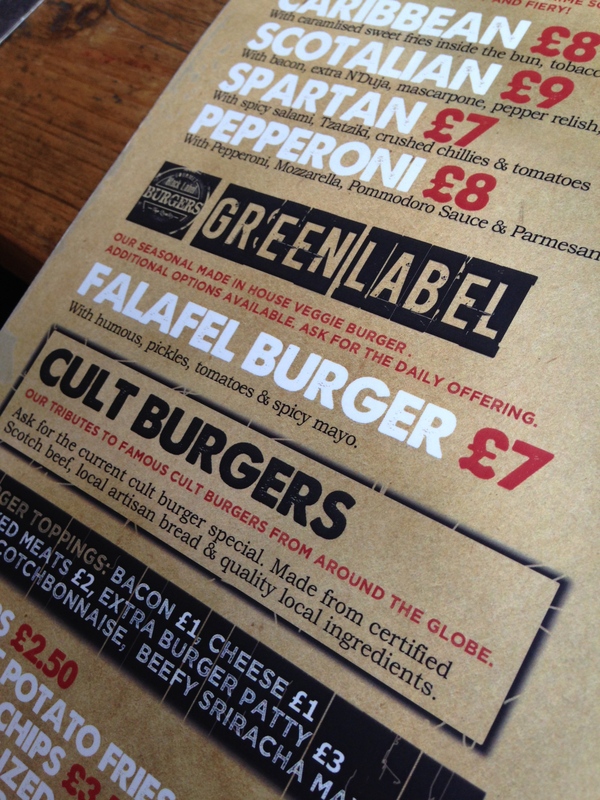 We’re already looking forward to seeing which new additions the guys at Bread Meats Bread add to the ‘Green Label’ in the future, but the falafel burger is a strong start and we’d order it again in an instant. If you think that there’s no such thing as a good veggie burger or that you couldn’t possibly enjoy a burger that didn’t contain meat, then we’re sure that this will change your mind. We’re excited to see what else appears on the ‘Green Label’. Even if you’re not a vegetarian or vegan, you really should give this a try. 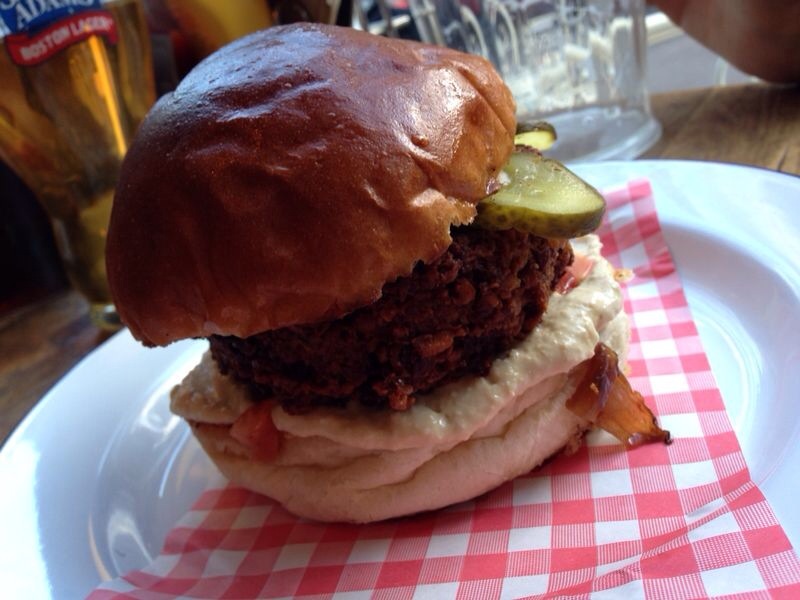 In our opinion, this is Glasgow’s best meat-free burger. + Nicely spiced, with a great crispy crumb coating. 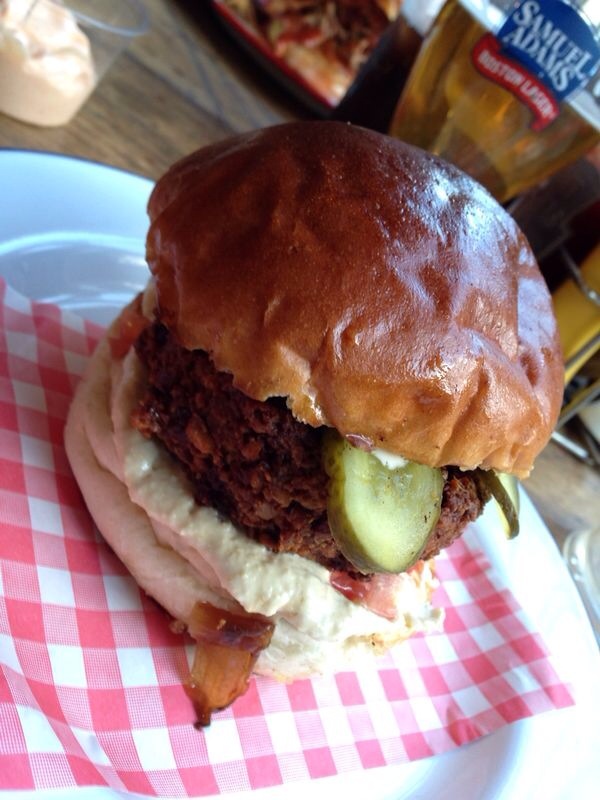 + Best veggie burger we’ve had in Glasgow. That looks delicious! My mum is flying to Glasgow today – I’ll tell her to go and try it. I had it at their Edinburgh branch today, slightly overcooked but still tasty and yes sweet potato fries with falafel burgers every time.